Despite the capping procedure, it became clear this week that the onrush of oil from the BP Deepwater Horizon rig will not cease any time soon. Even in the best case scenario, thousands of barrels of oil will still flow into the ocean. Destruction is already spreading along the Gulf Coast, and before the oil stops leaking, species might be extinct and industries destroyed. In the coming months—it’s not clear how many—oil will continue to pollute the Gulf of Mexico. BP and the Obama administration are talking about August as the end of this crisis, but other experts have projected that the spill could last until Christmas. As Justin Elliott reports for TPMMuckraker, BP told the government it could handle a spill much larger than this one. In the initial exploration plan for the well, BP claimed “it was prepared to respond to a blowout flowing at 300,000 barrels per day — as much as 25 times the rate of the current spill,” Elliott writes. BP cannot, it turns out, respond to a blowout flowing less than 20,000 barrels per day, and the consequences for the Gulf communities are only beginning to emerge. The first casualty will be Gulf ecosystem and its inhabitants. The second casualty will be the livelihood of Gulf communities that have depended on fish, shrimp, and oysters for survival. In 1979, another company released torrents of oil in the Gulf of Mexico, in much shallower waters than where BP was drilling. As Rachel Slajda writes for TPMMuckeraker, the clean-up methods the oil industry relied on three decades ago are similar to the technology BP is trying now. The Ixtoc spill was comparatively easy to address; yet it still took 10 months to stop. 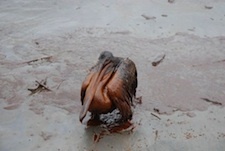 During that spill, the nearest state, Texas, had two months to prepare for the oil to hit shore, and still “1,421 birds were found with oiled feathers and feet,” Slajda writes. The fishing industry escaped much damage, but the tourism industry lost 7-10% of its business. In Louisiana, Mississippi, Florida, and other states affected by this spill, fish, fowl, restaurateurs, and oystermen won’t get off easy. As Care2 reports, the National Wildlife Federation has already documented the deaths of more than 150 threatened or endangered sea turtles and of 316 seabirds (“mostly brown pelicans and northern gannets”). All up and down this shoreline angry and scared people told me some scary and infuriating stories in the past few days. I heard about the the dead and dying wildlife we’re never going to see because the victims are being carted away to early responder ships and to inaccessible buildings onshore. I’ve seen some of those photographs which can’t be shown (according to BP’s new orders) of dolphins swimming through thick gunky oil, struggling sperm whales trailing wakes a mile long in thick gunky oil, dead jellyfish in gunky oil”. “You could potentially lose whole species, have extinction events,” Michael Blum, a Tulane ecology professor told IPS. “Brown pelicans were just taken off the endangered species list. On this threshold, a big dieback and mortality event, they would be pushed back into a situation where they could be endangered.” Also at Care2, Jay Holcomb, Executive Director of the International Bird Rescue Research Center, demonstrates a brown pelican being de-oiled, her feathers shampooed with Dawn detergent, her head and pouch cleaned with Q-tips. For generations, Gulf Coast residents made their living by fishing. Their fishing grounds are now off-limits. Some have found short-term work with BP fighting the oil. But those jobs come with new hazards. Some clean-up workers have reported dizziness, nausea, and shortness of breath that they think comes from exposure to chemical dispersants. BP is not providing safety gear that would clean the air workers breathe and has threatened to fire clean-up workers who bring their own, Colorlines reports. In the long-term, Gulf Coast fishermen may have no source of income and will have to abandon their homes and professions.